The Barska 32×80 Anchormaster with Floor Tripod is a classically Chic and robust telescope. It features 32x fixed magnification power and 80mm objective lens diameter. A part of Barska’s undying Classic Gourmand collection, the Anchormaster telescopes express traditional sophistication with exquisite mahogany and brass construction. The precision-made optics are in a category by themselves, as purposeful as they’re gorgeous. They boast fully coated achromatic lenses for crisp, brilliant photographs, and feature been structured in a refractor design with helical focusing rings. Brass mounts assist you to move the scope smoothly in all instructions. 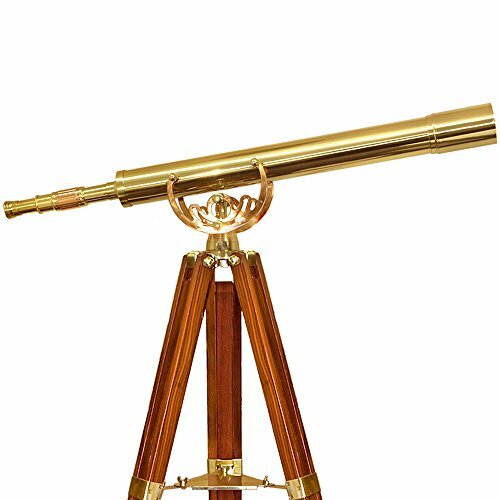 This telescope comes complete with a status mahogany floor tripod that has extendable legs and polished brass joints. It’s ideal for both celestial and terrestrial viewing. Barska is a around the world sports optics company offering an in depth line of precision merchandise. Known for combining innovation, advanced technology, and state of the art design, Barska supplies customers with high quality merchandise at remarkable worth. Each and every is subsidized by a restricted lifetime guaranty. 32x fixed magnification power. Fully coated achromatic lenses for crisp photographs. Status mahogany floor tripod with brass mounts. Chic and complicated telescope with traditional taste. Ideal for both celestial and terrestrial viewing.